Don't leave money on the table - you can ask for more! Salary negotiation is not an innate skill - it's something you must learn and practice to be successful. 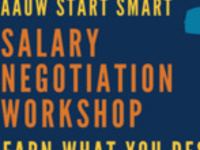 This workshop will help you learn how to calculate and articulate your value in the workforce, understand the factors that impact salary ranges and develop strategies to negotiate your next hourly wage or salary. This information is applicable whether you're applying for a summer job or interviewing for your first post-college position. Attendees will receive a buffet brunch and an individual workbook. Space is limited, so register through Handshake today.